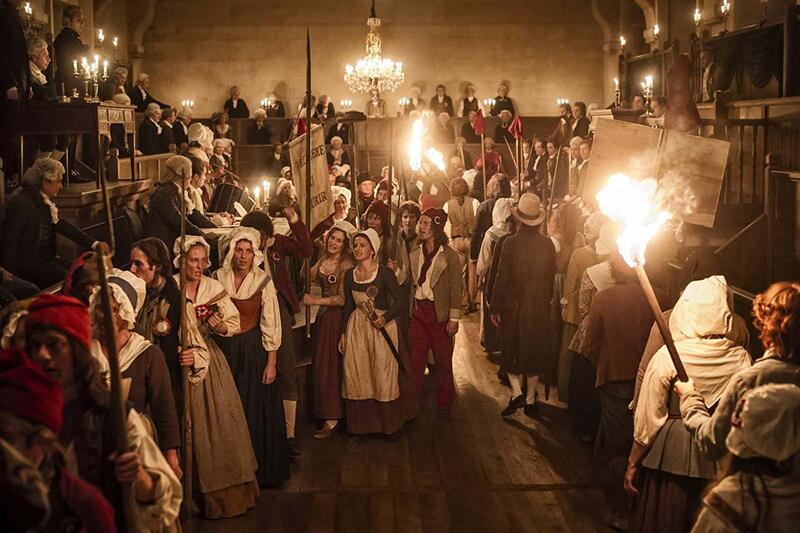 A new film on the French Revolution is a big event! 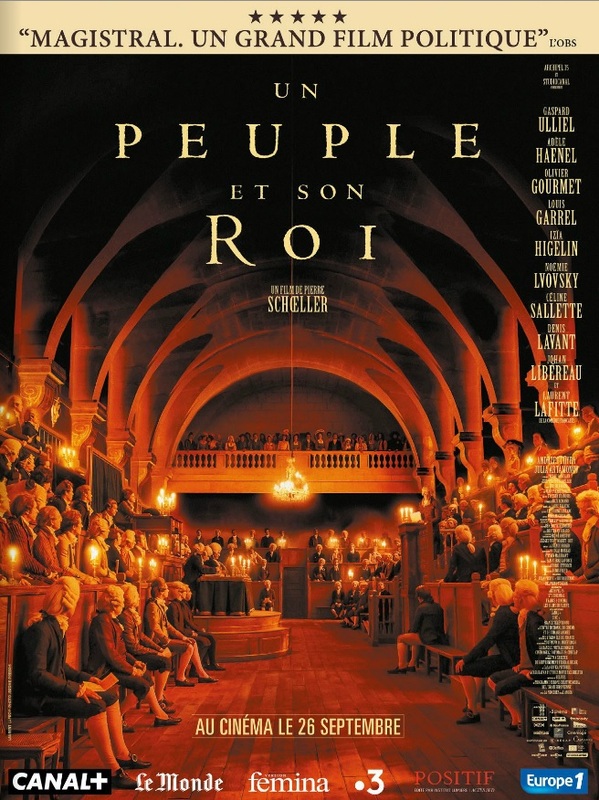 Un peuple, et son roi [One Nation, One King], directed by Pierre Schoeller, was premiered at the Venice Film Festival and went on general release in France on 26th September. It is a film conceived on a lavish scale: the cost of production was €16.9 million ($20.8 million) and there is a star-studded cast: Gaspard Ulliel (Basile), Louis Garrel (Robespierre) and Denis Lavant (Marat). The film is reported to be presold, indeed already "sold out", in several countries - Spain, Portugal, Benelux, Switzerland, Greece, Hungary, plus Japan and China - but not as yet in the UK or US. 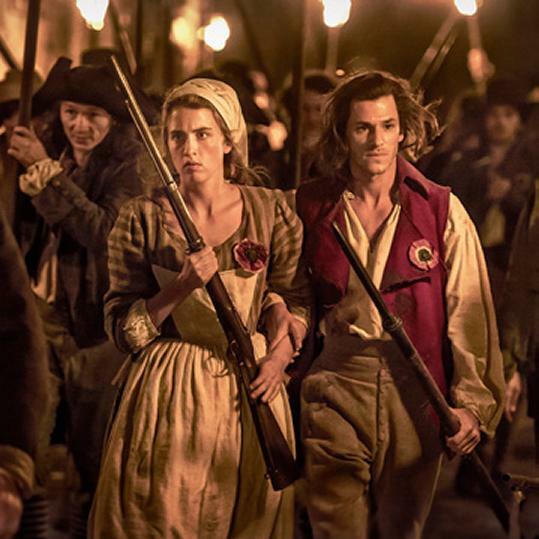 The main point of interest is director Pierre Schoeller's favourable approach to the Revolution and his determination to show events "from the point of view of ordinary people"
The action encompasses most of the major events of 1791-93. 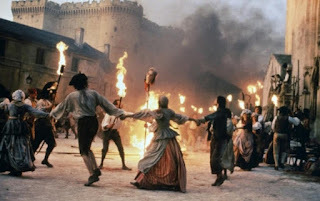 The storyline, which is really little more than a vehicle, concerns a young convicted criminal called Basile (Gaspard Ulliel), who is liberated and follows the King on his return from Varennes. He subsequently falls in love with Françoise (Adèle Haenel) and becomes an insurgent. I haven't seen the film, but the trailer (above) left me disappointed. The shots of the March on Versailles and the inside of the Assembly do not seem much more real than those of the French Revolution blockbuster by Robert Enrico and Richard Heffron, which was made thirty years ago. The American reviews confirm this first impression. The critic in Hollywood Review described the production scathingly as "a wannabe epic about the French Revolution that’s so bad it almost makes you wish France were still a kingdom". In his view the plot was thin and events too crowded in; political opinions were represented by slogans and historical figures reduced to caricatures. The deputies in the Assembly were just "men in foppish wigs spouting big ideas in tiny speeches". Ouch! Boyd van Hoeij " One Nation, One King': Film Review | Venice 2018", Hollywood Reporter, 09.08.2018. Unsurprisingly, the film has been more favourably received in France where its pretentions have been taken much more seriously. It has been advertised with the encomium "Magisterial. A Great Political Film". Pierre Schoeller takes himself very seriously indeed. And to be sure he addresses two extremely serious topics: the role of "the people" in the French Revolution and the legitimacy of political violence. 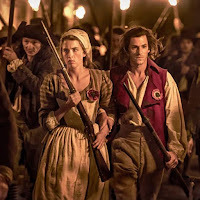 In his director’s statement, Schoeller says that he was inspired to make a film about the Revolutionaries because “these people built their sovereignty, established new relations of equality, ordained new rights (…). 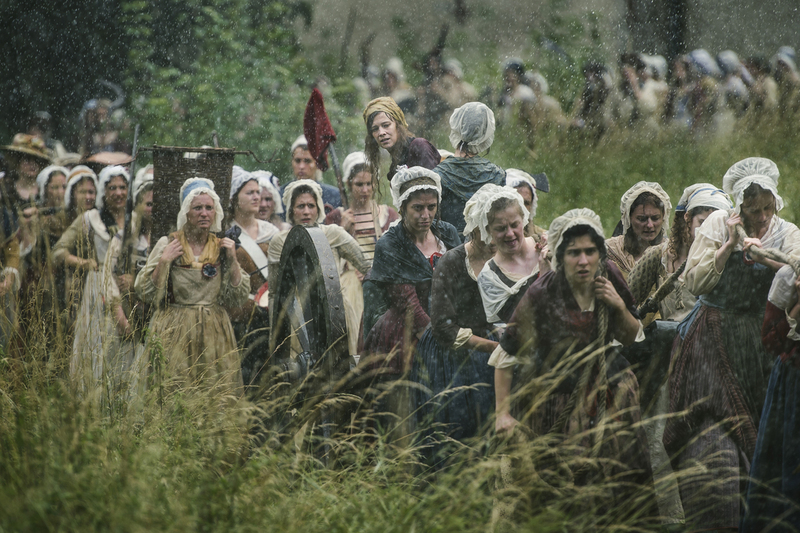 They have things to tell us.” He explains that he has organised his material around the concept of "le peuple décisif" and, as a secondary theme, around the importance of women in Revolutionary events. Jean-Clément Martin, "A propos du film de Pierre Schoeller, Un peuple et son roi. Comment analyser cette présentation d'une révolution populaire?" Published 10th October and available on Academia. As one might expect, Professor Martin is sympathetic towards the enterprise of portraying popular revolution. He declines to criticise the cinematography, though he does admits that the drama is in danger of being stiffled by the film's didactic purpose (Au risque...que la dimension didactique étouffe le film.) and by the need to reference a whole host of Revolutionary events. The opening scene shows a traditional ceremony in which Louis XVI washes the feet of twelve poor children of Paris assembled in Versailles. The scene, with the children in their blood red dresses, prefigures the bloodshed to come. The existence of such a ceremony was unknown even to Jean-Clément Martin but his researches confirmed that it did exist, in stylised form, almost down to the Revolution. However, in 1787 Louis was accused of avoiding the occasion altogether. This suggests a very different significance, implying the discomfiture of a modernising king. Professor Martin takes issue with the women's dress, their appearance"en cheveux" and, particularly, the amount of cleavage on display. No doubt this makes for good cinema. However, in 1789 women of the people would have demonstrated their respectability by wearing a fichu or scarf over their breasts. The march on Versailles in October 1789 is one of the major set-pieces. But it seems to take place along a country lane. In reality this was a major artiillery out of Paris which was constantly full of heavy, horse-drawn traffic. Also, why are the urban women of Paris depicted carrying scythes and sickles? Here we move on to the main core of Professor Martin's critique. He complains that some of the more difficult episodes of Revolutionary violence are omitted from the film - for example, the deaths of the gardes du corps on 6th October 1789. More fundamentally, although the events of 10 August are depicted in graphic detail, the September Massacres are mentioned only once, and that ambiguously (one of the characters wishes the victims paix à leurs âmes.). Another silence concerns masculine reactions to feminine violence - which was negative among supporters as well as enemies of the Revolution. Professor Martin contests the idea that there was ever a unified Revolutionary populace. The film presents only a small sample of stereotypical "sans-culottes": families of artisans and workers, with a few beggar children and a pittoresque vagabond thrown in for good measure. In reality, the radical supporters of Revolution were socially divided. They included well-to-do employers like the rich brewer Santerre and Duplay, a master-carpenter. Such patrons continued to be nervous about the demands of their workers. It is shame that Pierre Schoeller omitted real radicals like the Enragé Varlet, who wanted to establish direct democracy and equality between the sexes. Whole swathes of Parisian society are simply missing from the story: the mass of middling people, domestic servants, priests and believers, provincials and immigrants. To illustrate the true complexity of allegiances, Professor Martin draws attention to his researches on "les dames de la Halle" who led the October March, but who also demanded the preservation of Christmas and concerted together to oppose the radical femmes enragées. 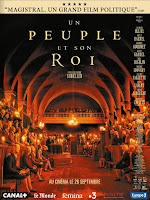 Un peuple, et son roi - the title presents a dichotomy which is misleadingly simplistic. Louis himself - played disconcertingly by the dark, lean Laurent Lafitte - is made into a pompous caricature, always sporting his decorations, and always shown in strange isolation. Similarly the film sets up a artificial contrast between the "people" and its representatives, those who act and those who debate. The political Revolution is represented entirely by the deputies who, apart from Marat, are portrayed as bewigged and impotent. They are invariably seen in the Assembly, with nothing shown of their lives or relations with others. This is evidently misleading. Danton, for instance, was heavily involved in the politics of his quartier, in the Cordeliers Club, in orchestrating the Revolution 10 August. (The printer Momoro, who appears briefly, was also a prominent figure in the Cordeliers.) Even the aloof Robespierre had close relations with the martyred sans-culotte leader Lazowki, and drew a "garde du corps" from the Sections. The proliferation of institutions - assemblies, delegations, committees - was one of the great characteristics of the period and its experiment in direct democracy. It is historically false to show as spontaneous and disordered the departure of the insurgents by torchlight on 10th August; the insurrection had been prepared several days in advance by the Comité de l'Evêché; the deposition of the king had been debated for weeks by the Sections; Danton, and even Pétion, were involved. Contrary to the impression given by the film, the action was the prerogative of armed men, with no women or children present. The film ends with the death of Louis XVI. The royal execution, as the accomplishment of popular Revolution, is linked metaphorically with the achievement by Basile, now a glassblower, of a perfect glass sphere. Jean-Clément Martin again points to omissions and errors which subtly alter this final message. There is no recognition of Louis's personal courage, no depiction of the intimidation which accompanied the vote for his death in the Convention (and the number of votes is wrong). There is also no sense of the massive security which surrounded the execution; Louis rode with two gendarmes, who personified the force of the state. All these factors militate against the idea that the King's execution represented a unanimous popular will or a lasting resolution of the Revolutionary crisis. Professor Martin's criticism is clearly of a piece with his insistence elsewhere on the importance of historical detail. A film must necessarily be selective. But, by ironing out the complexities, Pierre Schoeller has falsified the record. The film claims erroneously that "popular identity is natural, consubstantial, identified with the poor". Thus is sidestepped the whole fraught political debate about the nature of "the people", and the dilemma of the Rousseauist "general will". Moreover, says Martin, the justification offered for Revolutionary violence is a biased and misplaced one - it is "une légitimation dérangeante". Thank you for posting this. I very much want to see the film, but have not yet (I was recently in London, and the Institut français was showing it the day after I had to leave (SIGH!). So--my comments are in this context. Generally, I seems to me to be counter-productive to take any cultural text (film, fiction, history books, paintings and engravings and so on), and say it doesn't represent accurately. We only have access to history through texts, so how are we judging accuracy? 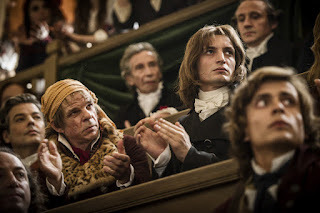 In the still of the Jacobin deputies (the one with Marat and Saint-Just, they don't look "bewigged" and the certainly were not "impotent, so I am not sure what Martin's point is. With a film, it's useful to look at the symbolism in images. An isolated Louis with all his decorations may be suggesting the tension between his "power" as king (all the decorations) and his inability to actualize that power (he could not convince the aristocrats to pay any taxes). Even though he theoretically held immense power, as a would-be reforming king, he was isolated in a court that did not support him, or his many finance ministers. Alcide Carton is a historian with a different point of view on the film. He says that we should see it and discuss it, and he likes the way the people are at the centre of it. There's an English translation on the website. The Marquis de Favras - courageous grammarian? The Frenchman and the "pot of porter"